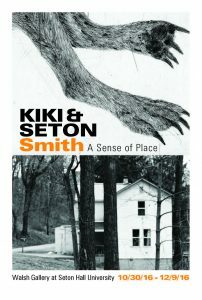 The Walsh Gallery, in collaboration with the Lennie Pierro Memorial Arts Foundation, is pleased to present Kiki and Seton Smith: A Sense of Place. Key to this exhibition is the idea that place irrevocably impacts our sense of self. Kiki’s drawings and prints look to the natural world to understand the relationship between place and identity on a symbolic level. Seton’s large-scale photographs look to the built environment to convey associations by moving within, and navigating through, space. Contextualized in this manner, the artists explore the complex psychological and emotional terrain to be negotiated in understanding the self and the manner in which place becomes a defining characteristic of identity. The fragility of the human condition and the places we traverse in our mortal journey are the narrative impulse of this exhibition. The Exhibition runs 10/30/16 to 12/9/16. Read Dan Bischoff’s recent Star-Ledger profile Sister Artists Return to South Orange.